The prestigious Reddford House School in Northcliff features 8 820m² of exposed timber roof trusses in varying styles and configurations. Exposed timber roof trusses are beautiful to look at and add a sense of elegance, grandeur and volume to a space, such as at the prestigious Reddford House School in Northcliff, Randburg, where LCP Roofing supplied 8 820m2 of timber roof trusses of varying styles and configurations. LCP Roofing was tasked with fabricating and erecting exposed timber feature trusses at the gatehouse, main building entrances, piazzas, the main hall and even the walkways, as was designed by Michael Bishop of Century Property Developments. “The modified scissor-with-top-hat trusses in the main hall proved to be quite challenging, not only from a design perspective, but also from a logistical point of view,” says Paul Guassardo, LCP Roofing sales representative. He explains that with a pitch of 27 degrees over a 19,5m wide span, a one-piece truss with a continuous top and bottom chord would simply be too big to deliver. The solution was to fabricate the trusses in three sections using two two-ply, half-modified scissor trusses and a separate one-ply top-hat truss. Once fabricated and delivered, the scissor trusses were erected. A mobile crane was required to hoist the 19,5m span trusses above the double volume of the hall and then each one into position. The LCP Roofing team worked efficiently, using the apron of scaffolding along the side of the walls. Life lines were not an option with the trusses having to be lowered from above, but once the trusses were temporarily braced, these were put in place and permanent bracing and anchoring could be done. The top-hat trusses were then fixed on top of the modified scissor trusses. The timber used was a combination of Grade 5 and 7 structural SA Pine, as well as structural SA Pine laminated timber beams, specifically sourced from sustainable and responsibly managed plantations. 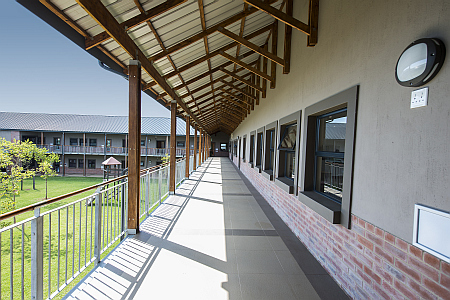 In an effort to reduce the energy embodied in erecting the timber roof trusses, the entire school’s roof structure (except in the main hall) was erected manually, negating the use of energy-hungry lifting equipment. In addition, solar geysers and panels were installed to reduce electricity usage and associated costs for the school in the future, enhancing the structure’s continued sustainability. Caption: The prestigious Reddford House School in Northcliff features 8 820m² of exposed timber roof trusses in varying styles and configurations.